Veterans sit through their introduction in the Regional Municipalities Veterans Treatment Court, part of Tucson City Court, which helps with treatment, rehabilitation, housing needs and employment referrals. 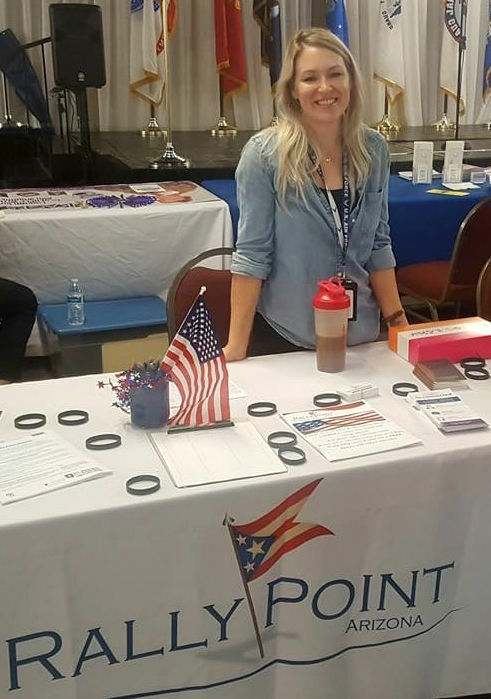 Charity McLean, a graduate of Veterans Court, works with Rally Point as a recovery coach coordinating substance-abuse and mental-health needs. Charity McLean after graduating from Air Force basic training. McLean, a graduate of the City of Tucson Veteran’s Court now works through Rally Point as a recovery coach coordinating substance abuse and mental health needs for participants. Served in the Marine Corps, presides over the Regional Municipalities Veterans Treatment Court. A five-year federal grant totaling nearly $2 million has been awarded to Veterans Court, a judicial treatment program for veterans or active-duty personnel who may have substance-abuse and mental-health issues that result in them facing criminal charges. Under the grant, the treatment-court program will receive $398,000 a year, said Tucson City Court Judge Michael Pollard, a founder of the 2009 program. The Substance Abuse and Mental Health Services Administration awarded the grant to the program, formally called Regional Municipalities Veterans Treatment Court. The court helps veterans facing misdemeanor charges receive treatment and in turn decrease their chances of breaking the law and returning to jail, said Pollard. Charges are dropped in most cases for those who graduate from the voluntary six-month program. However, the prosecutor requires defendants to plead guilty in driving-under-the-influence or serious domestic-violence cases. Those veterans must complete mandated classes, and their fees are paid by the program. Those charged with sexual or serious felony offenses cannot participate . Once in the program, random drug testing occurs and treatment can include substance-abuse counseling, anger-management sessions, mental-health services, and veterans in need will receive help with housing, finding employment and filing disability claims. There are veterans who were “mustered out of the military because of illnesses — PTSD and traumatic brain injuries — who were not properly diagnosed, and they received a dishonorable discharge and are not eligible for VA benefits,” Pollard said. He said the program is working with other agencies, including Old Pueblo Community Services, La Frontera and Rally Point, which offers mentoring and services from veterans, including graduates of the treatment court. The Veterans Administration also provides services . One graduate of the treatment program is Charity McLean, who now works through Rally Point as a recovery coach coordinating substance-abuse and mental-health needs for participants. McLean, an Air Force veteran, said she left the service in 2009 and suffered from undiagnosed PTSD. She was struggling financially, and had an infant son by 2016. She said she was not in a healthy relationship with her son’s father. The two argued one night, and McLean was arrested. McLean went through Veterans Court and was assigned a mentor, received counseling and attended anger-management classes. She said her mentor showed compassion and understanding, and she grew emotionally and spiritually through counseling. “It is an absolute honor for me to serve my fellow veterans through their own journeys of growth,” said McLean. During the program, veterans are required to attend court hearings, which include updates on their treatment, and discussions with counselors and others who assess their progress. Since January 2013 through May 2018, the program has served 696 veterans or active-duty personnel. Of the 696, 479 graduated — a 68 percent completion rate, City Court data show. And there was a 17 percent recidivism rate. In addition to DUI and DV charges, participants also faced charges of failure to appear, speeding, assault/disorderly conduct, criminal damage/trespassing and theft. In 2009, 18 courts across the nation had Veterans Court, and now there are more than 360 courts participating , said Pollard. He said Marana, Oro Valley, Sahuarita and South Tucson also refer veterans to the program, which costs $650,000, a year. It is supported by the federal grant and the municipalities through Southern Arizona Justice for Veterans, a nonprofit that fundraises for the program. University of Arizona law college students, under the supervision of attorneys, represent the veterans in court, and in some cases, city public defenders get involved, said Pollard. A nonprofit group puts veterans in passenger seats of drift cars to simulate the rush of adrenaline from combat. The fun is designed to be therapeutic.